My dad and I – January 18, 2009. I’m sure the pig in this photo is disturbing to some of you and that others probably didn’t even bat an eye. That’s how I used to be. This is typical of the food I grew up eating, what my mom bought in the store and prepared for us. It’s what she knew, what her mom passed down to her, and so on and so forth. I never questioned it and why would I? I was just a boy, too young to know better or to care. And I certainly didn’t have an opinion nor did I take a stance on the matter even as I got older. Besides, animals were put on this earth for us to eat – that is their purpose. They are just another commodity, like oil. But are they really? 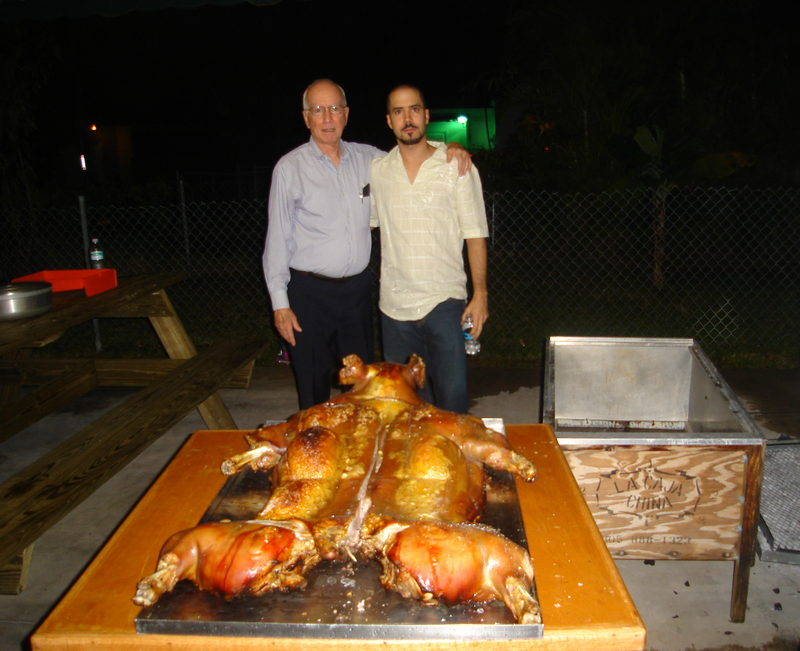 Being Cuban-American, I grew up eating a lot of animals, like this pig, on Christmas Eve and other holidays like Thanksgiving. Food is deeply rooted in our culture, as it is in everyones, and the traditions surrounding it are passed down from generation to generation. Our diets and the food we grow up eating depends a lot on where we were born and what is available to us. For the majority of the world, animals appear to be in never-ending abundance for us to eat (often very cheaply) and and we never question this process or its consequences; it’s just the way it is. But as much as culture, national origin, and availability plays a role in dictating what we eat, so does social-programming. It’s the set of rules we all learned to play by so we could fit in with society and it starts at a very young age. It says we need to drink milk because it does a body good, to eat cheese, Happy Meals, and consume copious amounts of meat everyday, three or more times a day. It’s what you do because everywhere you look it’s being fed down your throat, literally! From television ads, to radio commercials, billboards, school cafeterias, colleges, and universities. Powerful advertising campaigns send irresponsible, harmful, and emasculating messages to men that you’re not a “real man” if you don’t eat meat or you’re less of one if you don’t . But these “norms” come from a nefarious and selfish place where certain individuals, corporations, and government entities put profits and personal agendas over the health of its citizenry. They want us to be programmed and conditioned in such a way so that we don’t question what we’re eating, what it’s doing to us, or think about the ethical consequences of these actions. There would be too much to lose and too much at stake which is why there are ag-gag and food libel laws that protect factory famers and food producers. It’s why we continue to eat the same way we’ve always have, because it’s the only way we know how and because we think it’s the only way. It’s why I used to eat meat, dairy, eggs, and cheese and why the majority of the world continues to do so even though it’s making us sick. It took me about 40 years to break this vicious cycle of oppression and control, but you don’t have to wait so long. Although I now see this innocent, slain pig through a different set of eyes, I purposely chose to use this photo because not only does it have my amazing and beautiful late father in it, but it’s proof that you can shed the negative aspects of your culture, traditions, and upbringing and create a healthier and happier life for yourself. It shows that we have the capacity to question what we are told is “normal” and that we can draw our own conclusions and decide for ourselves what is best for us. It’s understandable that we make certain choices in life based on the information, data, and technology that is readily available to us at that particular time and that these decisions help shape our worldview. For example, a long time ago people thought the world was flat, but as new discoveries were made and theories were tested, the new worldview was that the world was actually round. Science can change our worldview about food as well. Today there is more and more evidence showing the benefits of a whole foods-plant-based diet (WFPBD) on our health and the detriments of an animal-based diet. One person credited for this is Dr. T. Colin Campbell. His work in this area led him to write, The China Study, which shows through years of scientific research that a WFPBD can not only reverse disease, but cure it as well. It’s never too late to start thinking about how the food you’re eating effects your health, especially when seven out of the 10 leading causes of death have a strong nutrition linkage; heart disease and cancers being number one and two respectively. It wasn’t until I read the book, Eat and Run, by Ultramarathoner, Scott Jurek, that I decided to try a plant-based diet. It didn’t take long for what Scott spoke about in his book to begin to materialize in my own body – less soreness after runs and workouts and faster recovery times. My initial reason for trying a plant-based diet was to improve my athletic performance but then I started to get more curious about this way of eating and began watching documentaries such as Forks Over Knives, Eating You Alive, Food Matters, Plant Pure Nation, Cowspiracy, Fed Up and others. I read more books and articles online and began educating myself more and more on how choosing to eat this way not only effects our health and physiology, but also the environment, the planet, and animals. And with that, I had a shift in consciousness. There’s a lot going on behind the scenes when it comes to our food supply and the different arms of government responsible for keeping us informed and healthy and I implore you to ask more questions, become more curious, and take control of your own health. I did and you certainly can too. Though you may not find it to be easy in the beginning, it will be worth it. And although customs and traditions make up a big part of our lives and our identity, there’s no reason you can’t begin making new traditions that are better for you, your family, our planet, and the animals we share this world with. If you’re ready to start taking the steps towards a plant-based diet but don’t know where to begin, I suggest starting by watching the following films: Forks Over Knives, Cowspiracy, What the Health, and Fed Up, and reading the book, Meatonomics, by David Robinson Simon. This is a great launching point and will have informed you enough to begin making the necessary changes to live a more conscious, healthy, and compassionate life. You can also visit our Resources page for more film, books, cookbooks, and website recommendations.